1. A story with a moral or cautionary message: Many people have read the fable about the fox and the grapes. 2. A fanciful and factitious story, a fabrication: That story about Mike's pirate ancestor is probably nothing more than a fable. 3. 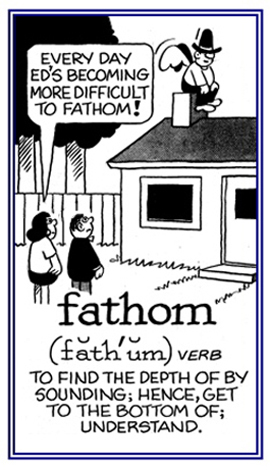 Etymology: from Latin fari, "to speak" (our words fame and fate are from the same root). Greek phama "fame", and phanai, "to speak", are also related to the Latin elements. To describe something that is imaginary, legendary, and not totally believable: There are those who still believe in the fabled Lock Ness Monster. 1. The front of a building; especially, an imposing or decorative one with special architectural design: It was interesting to see the windowless facade of the skyscraper in New York. 2. A showy, artificial, or deceptive misrepresentation intended to conceal something unpleasant or a superficial appearance or illusion of something: Somehow Sam's company managed to maintain a facade of wealth and well-being despite their financial losses. Henry could sense the hostility that was lurking behind Mildred's polite facade. 3. 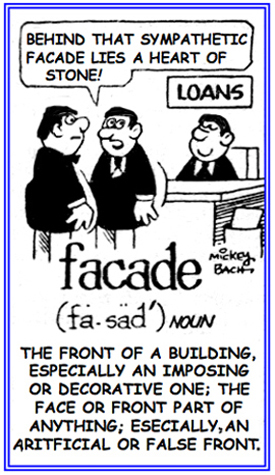 Etymology: "front of a building" from French façade, from Italian facciata; from faccia, "face"; from Vulgar (Common) Latin facia, "face". © ALL rights are reserved. Something which is popular or is taken up with enthusiasm for a short time: Marla's son, Floyd, is always interested the latest computer fads. Pertaining to that which is intensely fashionable or popular for a short time: Francine's faddish compulsion for the latest hair and clothing styles is driving her parents crazy. Someone who becomes very enthusiastic or interested in things for a short time: Marina was a sports faddist in her youth, then she joined book faddists who were members of a local book club. 1. 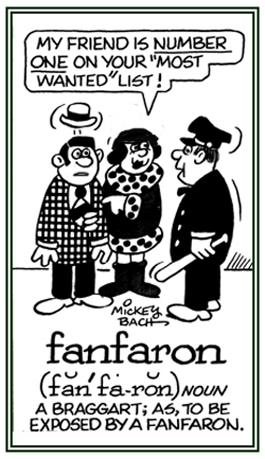 A swaggering boaster or braggart about doing something successfully: A fanfaron is someone who talks with excessive pride about his or her achievements. 2. 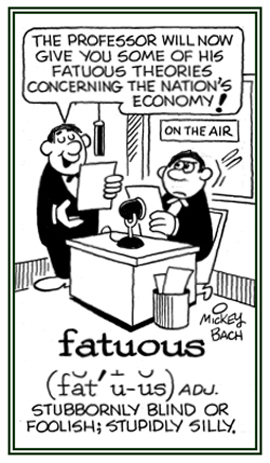 Etymology: from French and Spanish fanfarron, "braggart"; Italian fanfano, "babbler, an excessive talker". © ALL rights are reserved. 1. A male parent who produces, raises, and nurtures a child or children: The father joined a parenting education program with his daughter to help him improve his parenting skills. 2. A man who creates, originates, or founds something: There are those who say that George Washington was the father of his country. 3. When capitalized, a term that is used when talking to or about a priest; especially, a Roman Catholic priest: Father is used when greeting or talking with priests in the Roman Catholic Church or the Orthodox Catholic Church; while "Padre" is often used in the military. 1. To measure the depth of, to take a sounding of: Charles decided to fathom the depth of the lake near his home before he would buy a boat for fishing. 2. To get to the bottom of; to manage or to comprehend a problem etc. : Mike couldn't fathom why his daughter decided not to wear a warmer coat on such a cold day. © ALL rights are reserved. 1. Relating to foolishness, silliness, or stupidity; especially, in a smug or self-satisfied way: Mark had a habit of making fatuous remarks even during serious conversations. Jane's fatuous ideas about what her friends should do during the bad economy were ridiculous. 2. 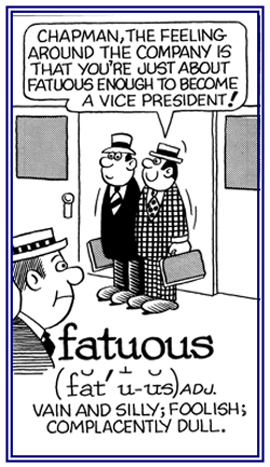 Etymology: from Latin fatuous, "foolish". © ALL rights are reserved. 1. To try to get the approval of an important or well-known person by praising him or her or giving special attention to his or her desires: The waiters were fawning all over the celebrities at the high-class restaurant. Lina actually enjoyed being fawned on by her fans. 2. To give a servile display of exaggerated flattery of affection, typically in order to gain favor or an advantage: Some of the employees fawn over the president of the company whenever he appears in person in their work areas. Some politicians have been known to fawn over anyone with money who is willing to support their campaigns. 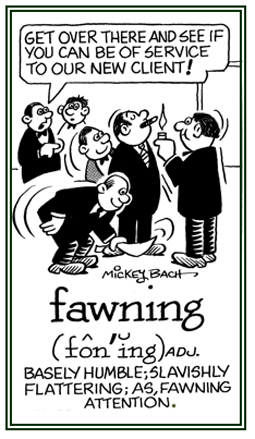 Pertaining to displaying exaggerated flattery or affection in an obsequious manner or as if one were a slave or humble servant: The employees were giving special attention to and behaving in a fawning way to the new chief executive of the company. When the Hollywood stars entered the hotel, the employees were giving more fawning services than they usually do for other famous people. The wealthy man was surrounded by a group of fawning company representatives in order to encourage him to invest in their business. To cause someone to feel afraid, upset, or uncertain: Patricia was told that she would never succeed as a writer if she let criticism faze her. 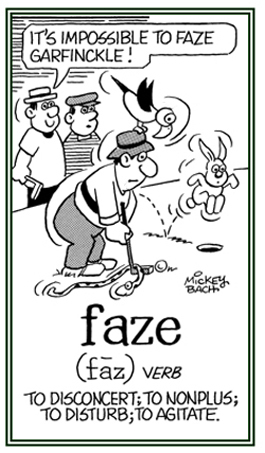 David’s teacher told his English class that the verb faze had several negative meanings; for example: disconcert, fret, disturb, perturb, worry, upset, etc. A common error that some people make is to spell faze as "phase" and so everyone should be aware that these terms have completely different meanings! 1. A very bad person who has been convicted of a serious criminal act which might be punishable by death in some countries or states: The convicted felon was imprisoned for 10 years before his case was reviewed. 2. 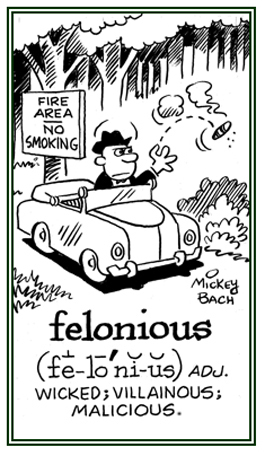 Those who have committed a more serious crime than those designated as misdemeanors; for example, aggravated assault as contrasted with a simple assault or a misdemeanor: Although the man was convicted as a felon, he protested his innocence. Characterized as a wicked and vicious criminal act: James intentionally committed a felonious homicide when he shot his neighbor during an argument. © ALL rights are reserved.